On arrival in New Zealand the Te Arawa people explored the Bay of Plenty to the far eastern reaches of Whangaparāoa (Cape Runaway) and to the inner harbours of Waitematā (Hauraki Gulf). At that time, the Bay of Plenty was densely forested to the shoreline. Repeated burning improved access inland and also encouraged the growth of bracken fern, tī and tutu. 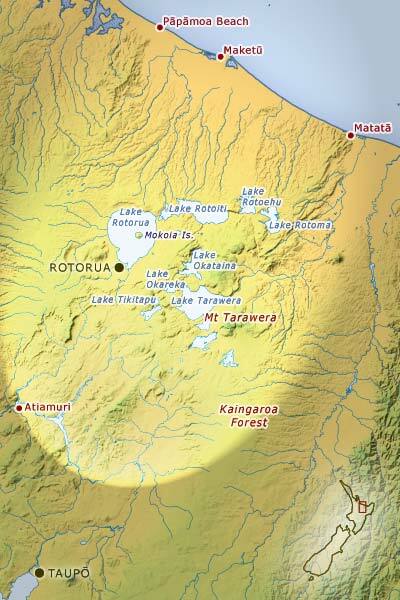 The people soon moved inland toward the geothermal areas around the Rotorua lakes. Te Arawa allude to this entire territory in their saying ‘Mai Maketū ki Tongariro ... Ko Te Arawa te waka’, which places the prow of the Te Arawa canoe at Maketū on the Bay of Plenty coast, and the stern at Mt Tongariro.